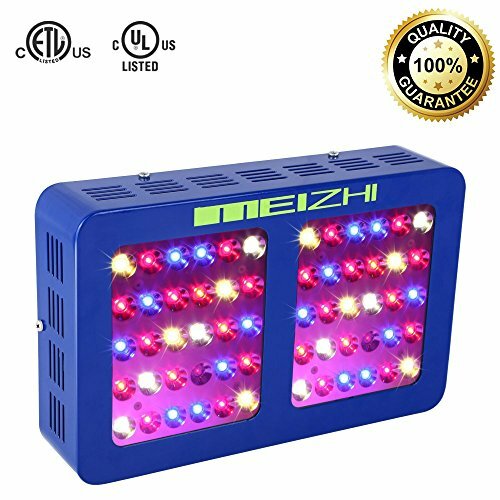 MEIZHI Reflector led grow light full spectrum fits for hydroponic indoor plants, soil breeding, potted or seeding need, etc. We devote to create the most efficient, powerful and energy-saving grow lights to ensure maximum yield with minimum power usage and heat. - Blue lights increase cell proliferation, Red lights improve cell division and 2 IRs(which is a little dim but really useful) to improve the fields and get higher THC. - Suitable for hydroponic and soiled plants. Likes Lettuce, potatoes, tomatoes, rosemary, basil and parsley, etc. - 50000-100000 hours lifespan and ETL certification. - Service center available in California, always awaiting your contact. 5. Both switches on - the fan works. UL & ETL Certification and Eco-friendly Products - MEIZHI spends more costs on product quality, safety factors, environmental impact and pre-sales, in-sale and after-sales services. Reflector Design - Newly upgraded MEIZHI reflector 300W led grow lights for indoor plants adopt 120° compact reflector panel concentrate all light beam on the plants, maximize light spreading efficiency to maintain high yield. Energy Saving - 300 watt led grow light consumes only 139W±10%@AC110V while replacing 300W traditional hps, and gives your plants 100% usable light that is completetly tuned to create maximum photosynthetic response. Perfect for 2ft×3ft growing area at 18'' height. Dual Switches - Veg and flower switches can be shifted freely to adjust the spectrum in seeding, blooming and harvesting stages to configure the optimal lighting scheme for plants and save energy. Superior Cooling System - 1 fast speed cooling fans with lower voice transmit the heat out through dense vents around to format powerful heat sink dissipation system to protect plants. 12 months repairing service and 30 days money back without reason in addition. If you have any questions about this product by MEIZHI, contact us by completing and submitting the form below. If you are looking for a specif part number, please include it with your message. Durolux DLED824W LED Grow Light | 2 Feet x 1 Foot Real 50W LED with White 5500K FullSun Spectrum and 10000 Lux Great for Seeding and Veg Growing! Over 50% EnergySaving!